There’s a lot to unpack when you see Us for the first time, and even more to chew on after seeing it again. Like some of the best horror films, Jordan Peele’s follow-up to Get Out is thematically complex and much of those themes are open to individual interpretation. In addition to spurring interesting post-viewing conversations, Us has also sparked some fascinating theories, like this one from Reddit regarding Evan Alex’s character, Jason and his double, Pluto. Spoilers ahoy, obviously. Vulture compiled a list of evidence to support this bonkers theory from Reddit, and it’s pretty damn compelling. 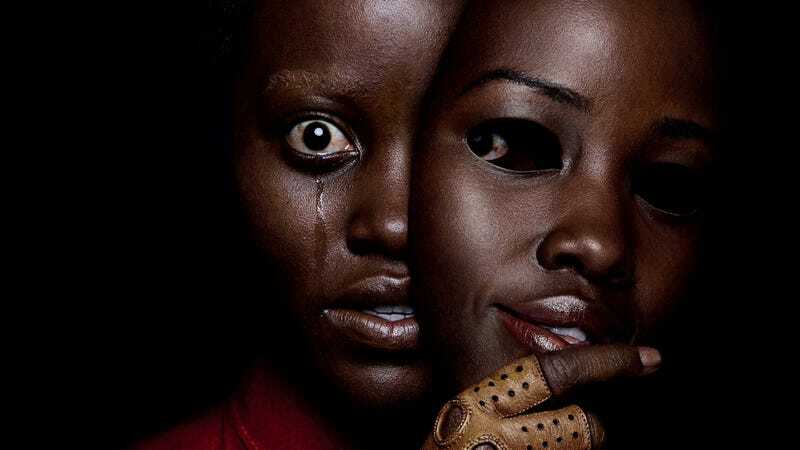 The basic idea is this: In the third act of Us, it’s revealed that Lupita Nyong’o’s Adelaide Wilson and her subterranean double, Red, swapped places when they were children. In the film’s final scene, Adelaide/Red gives her son a knowing smile, and he pulls the werewolf mask–his comfort item–down over his face. According to this theory, Jason and his double also swapped places at some point–possibly when the Wilson family visited the beach house the previous summer, or maybe years earlier, which would explain why Pluto appears to be stuck in a toddler state, crawling around and struggling to speak. That makes sense, given that flashbacks to Adelaide/Red’s childhood reveal her parents fretting over her seeming inability to speak. One key to this theory is Michael Jackson’s “Thriller” video, which is featured on the shirt young Adelaide wears. The smile she gives Jason at the end of Us mirrors the devilish grin Jackson gives at the end of his video, and when Jason pulls the mask over his face, it could be read as an acknowledgement of a shared secret–he, too, is a monster. There’s also the scene at the beach, where Jason is digging tunnels instead of building castles, a possible reference to his origins. But the most convincing evidence involves Pluto, the only “tethered” who doesn’t try to kill his untethered counterpart, and who mirrors Jason’s actions. According to the film’s mythology, the tethered were created in an attempt to control their aboveground doubles, and Jason seems to be able to control Pluto fairly easily (as when he makes him walk backward into the fire during the climax). A particularly haunting piece of evidence explains how Pluto got those scars on his face: We see how the tethered clumsily attempt to mirror the untethered in the tunnels below, so it seems likely that every time Jason tried and failed to perform his magic trick–where he strikes a flint-like object near his face–Pluto simultaneously sparked a lighter of some sort near his own face, burning it in the process. There’s even more evidence to support this theory over on Vulture, including the references to Jaws and Friday The 13th, as well as some ideas about the rabbits. It’s definitely one of the more bananas theories out there, but it’s also a very believable one.